The 5 image limit remains with Email, which is actually a limitation aimed at preventing emails from bouncing (or not sending) due to being too large of a file size. Most email providers have a 20MB attachment limit, which the 5 photo limit tends to follow. If you would like to get around the five picture limit of sending through email, you can choose the “Message” option instead of email, this will use the iMessage protocol but it does require that iMessage is set up on the sending and receiving devices. Using the Message option also lets you send the pictures to a Mac with iMesssage. iMessages requires iOS 5 or later, meaning earlier model iOS devices won’t be able to use that specific feature. This feature remains the same in iOS 7 and iOS 8, though it does look slightly different, as does the rest of iOS. The limitation should be based on file size not count, this is why you can only email one video if it’s long but two videos+ if they are short. Step 2 is wrong, I suppose you meant “Tap the arrow icon in the UPPER RIGHT corner”. Thaaank Yoooou!! Thought I had gone mental! The arrow in the upper right doesn’t do anything at all. After tapping the arrow in the upper right hand corner you can select the pictures you want to send. 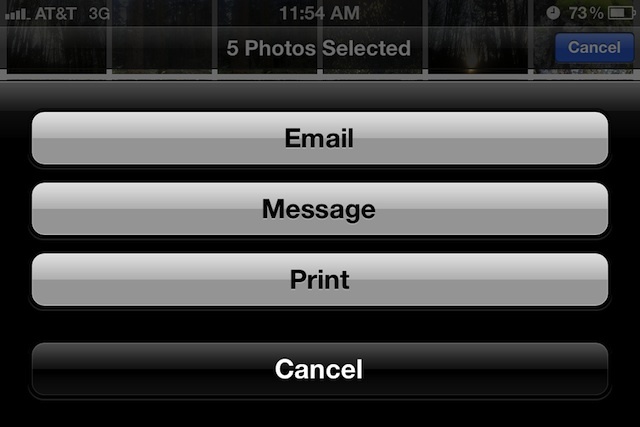 Then use the options at the bottom of the screen to manage the pictures. Now if we could only attach photos while composing an email. I dont have an arrow in the top right corner of my 4s. POS! When you go to your photos you must select edit then you click on share and then e-mail. My iPhone 4 version 5.1.1 on the left bottom of the screen with selected pictures has SEND button, but then , pressed, has only PRINT or CANCEL options. I just tried it and learned that you can MMS up to six photos at a time. I think 5 is the limit for email. Select fewer photos and the options will be there. I have the SAME problem!! so frustrating. Have you learned how to change that and get options for sending??????? I have followed the instructions, but when I press “Share” I only get two options, “Print” and ” Cancel”. There is NO email option. What gives? I have followed your instructions, but when I press “Share” I only get two options, “Print” and ” Cancel”. There is NO email option. What gives? 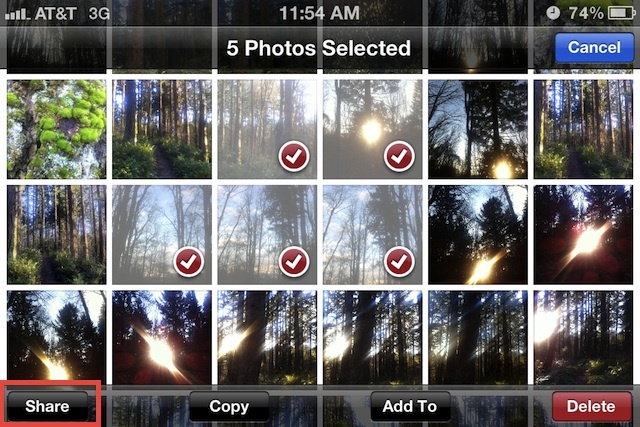 I just figured out that I do get the option to send when I select fewer photos. I was trying to send too many. I eliminated a few and the “send” option came up. why are emailed photos being received on other’s devices too large and sideways? is there a setting to correct this? Don’t turn your phone sideways when you take a picture. When you email a large photo, it may ask you if you want to send it as Small, Large or Original size. I have a iphone 4s with iOS6. On my phone you must select the “EDIT” button in the upper right hand corner. Then you can select multiple photos and select “SHARE” at the bottom. I followed your steps, Dan, as I too have a 4s with iOS6 and recently updated to .1. I only can send through photo stream, Facebook, Print and Copy. I copied my photos and pasted them into my email. Not sure if that’s how it’s supposed to work, but that’s what I did. if you want to mail pics as attachment and not as embedded pics in the mail body. Use a zip software like izip or winzip and mail that zip, will solve the problem of sending more than 5 pics in more compressed format. On my phone (5) you have to tap the edit button in the top right corner of the camera roll. It only supports up to 5 pictures or the share button won’t even list Mail as a share option, and on the iPod Touch on iOS 6, you must tap the edit button within the Photos app and then select your 5 photos at a time, then tap share in the bottom left and select Mail. Holy Jeezus! Intuitive? If it’s that intuitive why are there dozens of websites explaining how to do this? What a load of rubbish these iphones are! What is intuitive is a button in the email program that says “Attach”. That’s intuitive. So intuitive in fact, that every email program in the world has it… except iPhones/iPads/iPods. I’m hating this stupid waste of space device the longer I have it. Give me Android any day… in fact I’d rather have two tins and a piece of string. I despise this rubbish phone. I don’t get the option to size my pictures from iPhone XS when sending via email. It’s sends pictures to big and DOES NOT give me the pop up to make pictures small, medium or original .